For other uses, see Senja (disambiguation). 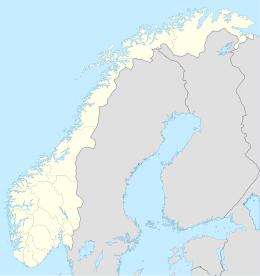 Senja (Norwegian) or Sážžá (Northern Sami) is an island and future municipality in Troms county, Norway. At 1,586.3-square-kilometre (612.5 sq mi), it is the second largest island in Norway (outside of the Svalbard archipelago). It has a wild, mountainous outer (western) side facing the Atlantic, and a mild and lush inner (eastern) side. The island is governed by four municipalities: Torsken, Tranøy, Lenvik, and Berg, however in on 1 January 2020, the four municipalities are scheduled to be merged into one large Senja Municipality. The island of Senja had 7,864 inhabitants as of 1 January 2017. Most of the residents live along the eastern coast of the island, with Silsand being the largest urban area on the island. The fishing village of Gryllefjord on the west coast has a summer-only ferry connection to the nearby island of Andøya: the Andenes–Gryllefjord Ferry. The island sits northeast of the Vesterålen archipelago, surrounded by the Norwegian Sea to the northwest, the Malangen fjord to the northeast, the Gisundet strait to the east, the Solbergfjorden to the southeast, the Vågsfjorden to the south, and the Andfjorden to the west. Ånderdalen National Park is located in the southern part of the island. The Old Norse form of the name must also have been Senja or perhaps Sændja. The meaning of the name is unknown, but it might be related to the verb sundra which means to "tear" or "split apart", possibly because the west coast of the island is torn and split by numerous small fjords. It might also be derived from a Proto-Norse form of the word Sandijōn meaning "(area) of sand" or "sandy island". The island of Senja is located along the Troms county coastline with Finnsnes as the closest town. Senja is connected to the mainland by the Gisund Bridge. The municipalities located on Senja are Lenvik (part of which is on the mainland), Berg, Torsken, and Tranøy. The northern coasts of Senja faces the open sea, the western coast faces the islands of Andøya and Krøttøya, the southern coast faces the islands of Andørja and Dyrøya. On the western coast, steep and rugged mountains rise straight from the sea, with some fishing villages (like Gryllefjord, Husøy) tucked into the small lowland areas between the mountains and the sea. The eastern and southern parts of the island are milder, with rounder mountains, forests, rivers and agriculture land. Senja is often referred to as "Norway in miniature", as the island's diverse scenery reflects almost the entire span of Norwegian nature. Senja is known domestically for its scenery, and is marketed as a tourist attraction. Climate data from the village of Gibostad on the eastern shore of the island; facing the mainland during the base period of 1961-1990. The western side of the island, facing the Norwegian Sea, will have slightly milder but more windy winters. Naturally, the fishing industry is dominant on Senja, notably the Nergård Group at Senjahopen and Brødrene Karlsen at Husøy. At Skaland there is some graphite mining. Another important industry that can be mentioned is ArtNord and Tromspotet at Silsand, which specializes in potato and potato products, and the stair factory in Sollia. Sollia also has the world's northernmost insulation glass factory, Nicopan AS, which has customers throughout Norway, plus some exports abroad. The residents of Senja have the Gisund Bridge as a ferry-free road connection to the mainland across Gisundet to the town of Finnsnes. The town serves as a trading center for the entire Mid-Troms region, including the island of Senja. The island is also connected with the other towns in the county. At Lysnes on northern Senja you have a fast boat connection with the city of Tromsø, a trip that takes about 50 minutes. From the villages of Flakstadvåg and Skrolsvik on the west and south side of the island, there are also ferries to the town of Harstad to the south. During the summer there is a ferry between northern Senja and the island of Kvaløya, between southern Senja and Harstad, and between Gryllefjord and Andenes. There are four main roads on Senja. The main road is Norwegian County Road 86 which crosses the Gisund Bridge from Finnsnes, Sørreisa, and Bardufoss. It extends across the island to Torsken and Gryllefjord. From Silsand, Norwegian County Road 861 goes north along Gisundet to Gibostad and northern Senja. Norwegian County Road 860 goes from Stonglandseidet to Silsand, Norwegian County Road 862 goes from Straumsbotn in Berg, via Senjahopen to Botnhamn in Lenvik. In March 2017, the Parliament of Norway voted to merge the municipalities of Berg, Torsken, Lenvik, and Tranøy. The new municipality will be established on 1 January 2020 as Senja Municipality (Norwegian: Senja kommune). It is located in the traditional district of Hålogaland. The administrative centre of the municipality will be the town of Finnsnes. The municipality will include all of the island of Senja, the smaller surrounding islands, and part of the mainland between the Gisundet strait and the Malangen fjord. The coat of arms is going to be blue with a white outline of the Okshornan mountain with a green depiction of the northern lights above the mountain. Among the sights of the island are Ånderdalen National Park with coastal pine forests and mountains, traditional fishing communities, and the Senja Troll, the world's largest troll statue. The southernmost municipality Tranøy also has several small museums documenting local history, among these the Halibut Museum ("Kveitmuseet") in Skrolsvik. The island of Senja is mentioned in David Armine Howarth's World War II novel We Die Alone: A WWII Epic of Escape and Endurance. It has a namesake island in the MMORPG Tibia. The Norwegian musician Moddi comes from the island and his music is said to have been influenced by its beauty. ^ a b Statens kartverk. "Øyer i Norge - største i hvert fylke" (Excel) (in Norwegian). Archived from the original on 17 July 2011. ^ a b c d e Thorsnæs, Geir, ed. (2018-05-09). "Senja". Store norske leksikon (in Norwegian). Kunnskapsforlaget. Retrieved 2018-08-25. ^ "Bidrag till Fennoskandiens språkliga förhistoria i tid och rum" (PDF) (in Swedish). Helsingfors Universitet. Retrieved 2015-12-27. ^ "eKlima Web Portal". Norwegian Meteorological Institute. Archived from the original on 2004-06-14. ^ "Senja kommune 2020" (in Norwegian). Retrieved 2017-09-09. ^ Vermes, Thomas (2017-03-29). "Stortingsflertallet gjør fire Senja-kommuner til én". ABC Nyheter (in Norwegian). Retrieved 2017-09-09. ^ Henriksen, Steinulf (2018-05-25). "Det viktigste Senja-våpen". Folkebladet (in Norwegian). Retrieved 2018-08-25. ^ "Ånderdalen National Park" (in Norwegian). Directorate for nature management. Retrieved 2010-04-04. ^ "Moddi". Propeller Recordings. Retrieved 2013-01-03. This page was last edited on 21 January 2019, at 02:11 (UTC).